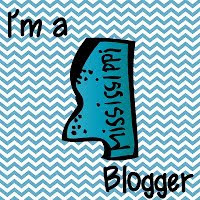 Today is all about showing where you spend the majority of your time.... the classroom or more like my home away from home. 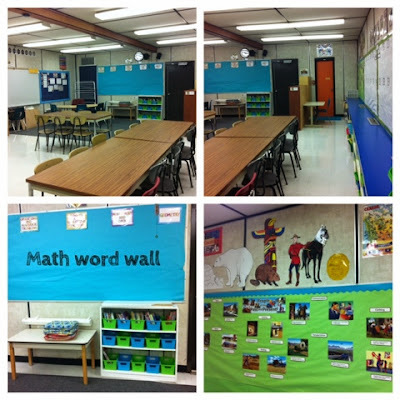 I am sure everyone's classroom is their 2nd home. 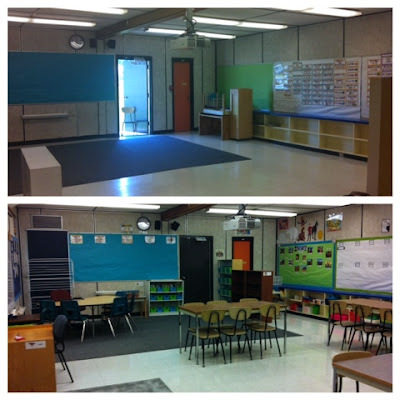 If you're like me you often have your classroom more organized and cleaner than your own home. Here are some before & after photos of my classroom this year. School doesn't start for 2 more weeks so the classroom is not 100% ready. There are still a few more things I need to add. It's definitely different decorating a classroom for grade 4 instead of kindergarten. 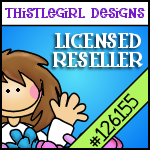 Well here is a glimpse at what's going on so far. 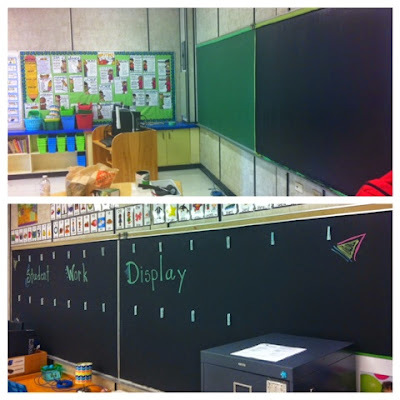 The classroom I moved into this year had 2 of those ugly green chalkboards. I painted it with black chalkboard paint & hot glued some cute light blue clothes pins to the board. This will be the Student Work Display area. 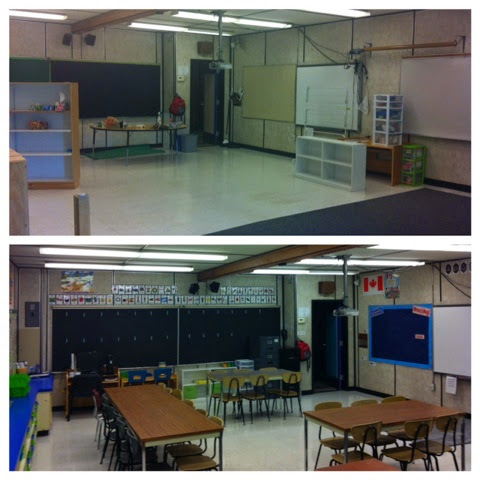 This classroom is part of the add-on from a few years back so they are portables. The awful cream walls in this room just kill me. :( I wish we could paint them. I still have some more posters & things to put on the wall to try & cover these ugly walls up. I don't want to make the walls full of clutter either. Here is a glimpse of the classroom from the door. I love having an exit door also in the room that leads to the playground. It's especially great to have in the summer and fall when you just want the door open for fresh air through out the day. 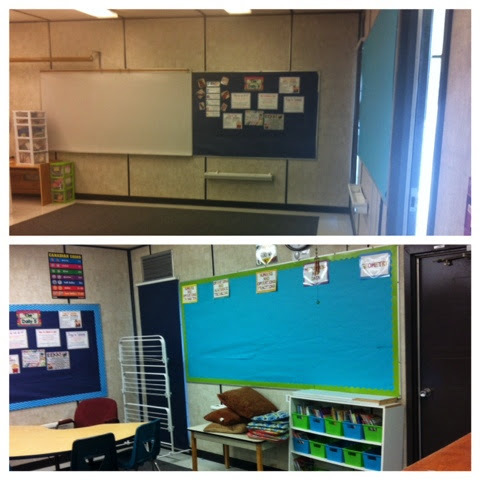 This area is for student work to be displayed. The computer & writing table is set in front of this area. Eventually student work will hang from that brown pillar that runs in the middle of the ceiling in the classroom. 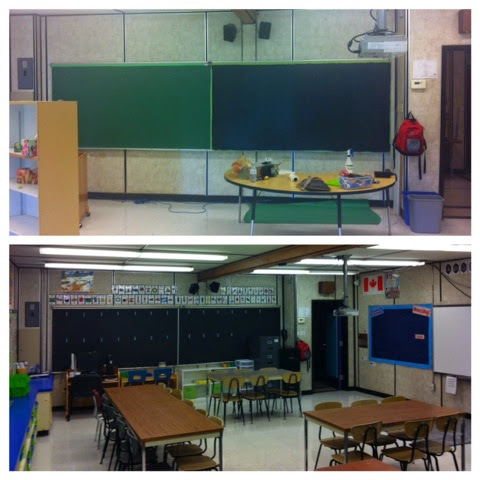 Learning all about plants is a big part of the grade 4 curriculum so that white rack will have lots of plants on it eventually. The students will be in charge of caring for them through out the year. 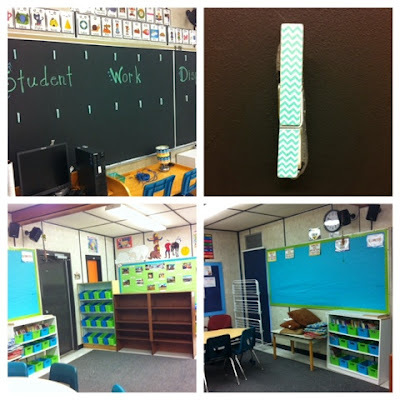 The classroom colours are navy, lime green & turquoise. I still need to add lots more colour to the room & get some things to hang from the ceiling. 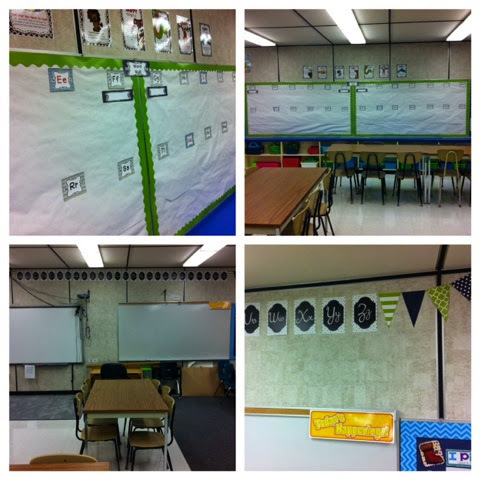 Here is the word wall display and cursive handwriting alphabet I made for my classroom. There's that dreadful yucky wall again. I had to get a close-up of the clothes pin for the students to put their work. You can't tell that they are chevron, polka dot & stripes from the photos. Our school ordered book bins this year for every classroom for Daily 5 and we are so excited about that. My bins are of course lime green and turquoise. 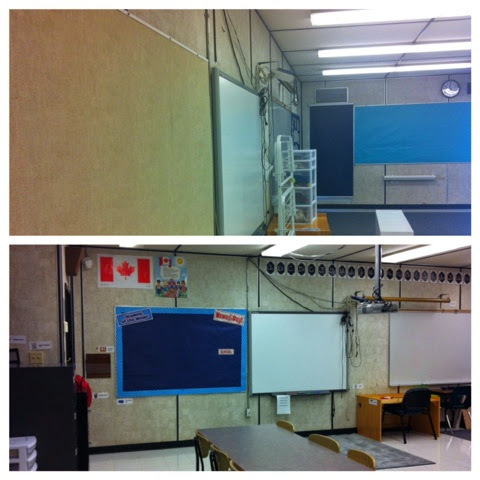 Well that's a glimpse of my classroom so far. I will have to post the finished product once it's done. I am not going all out for the room until I come back from maternity leave in January. I plan on buying a couch for the reading nook then along with a lamp & some stools. 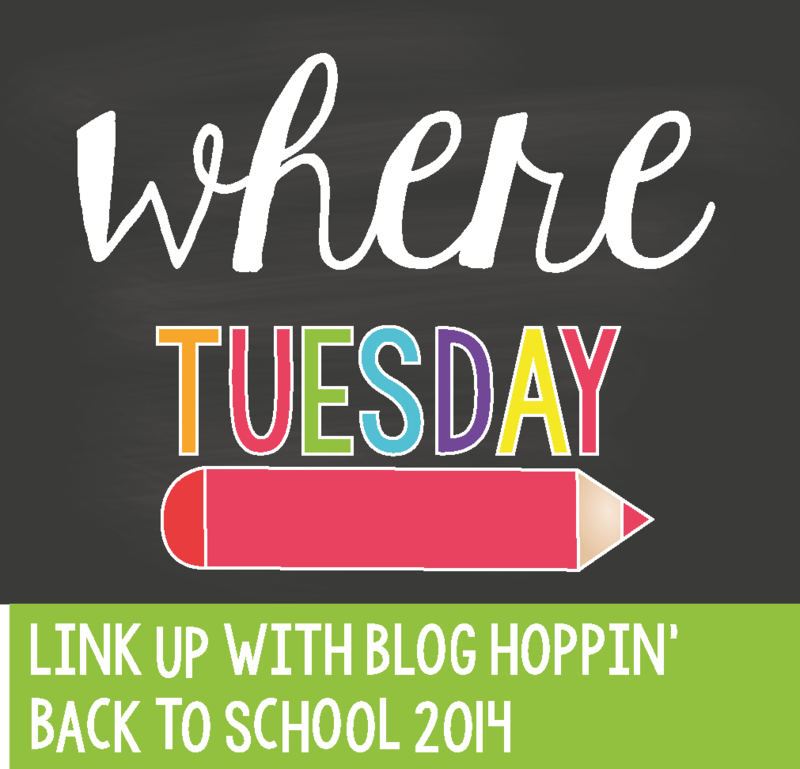 Stop by Blog Hoppin' to check out all the other classrooms. 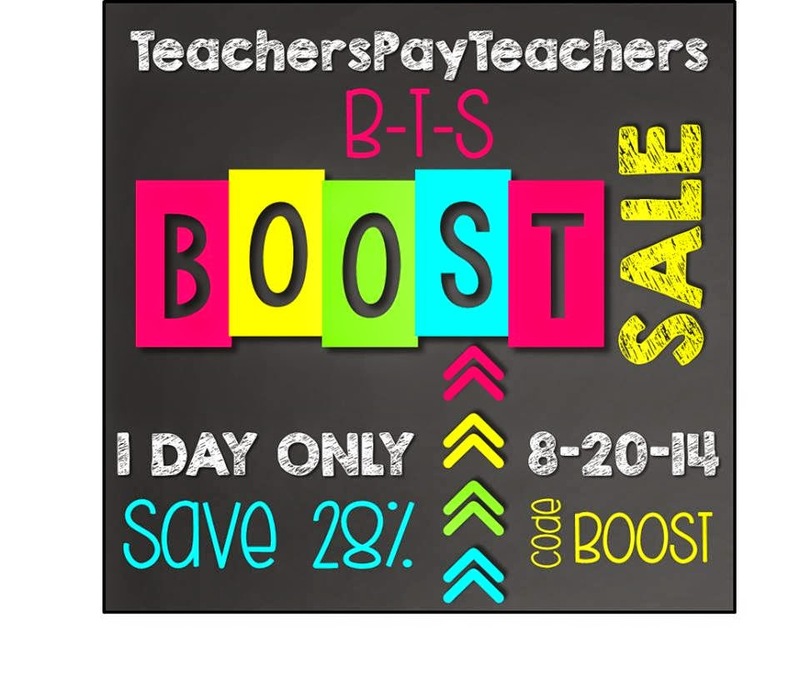 Oh & don't forget the sale that is going on tomorrow at Teachers Pay Teachers. You have worked so hard! I wish everyone could see just how much work teachers put into getting their rooms ready! The painted boards turned out cute and i love your colors. Have a great year!